An extraordinary hand beaded gourd bowl featuring a wonderful array of traditional Huichol (pronounced wē-ˈchōl) designs. Added carving on the bowl itself really makes this pop. This bead art was done with iridescent and metallic glass beads that are imported for the best artists to work with. Each bead is meticulously placed in a thin layer of beeswax creating a tapestry like effect. 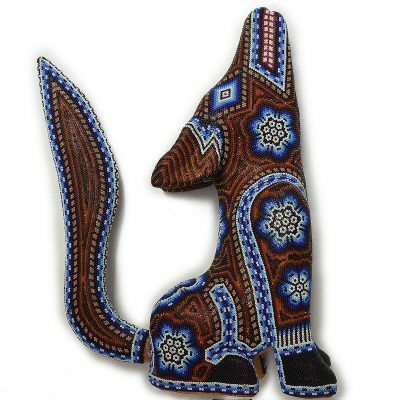 Truly authentic Huichol art can be hard to find today. Many artists have lost cultural connections migrating to big cities far from home. The art we represent supports artists who still live in the Sierra Madre Occidental, helping them stay connected to their ceremonies and rituals that make up what it means to be Huichol.